My sister is an actor, and a couple years ago she wrote a post about generosity that really resonated with me. She said that if you see a great role that someone else would be perfect for, you should share it. She said that to get other people to root for you, you have to root for them. Its better to go through the stress of auditions with people by your side. I really think the same is true for job hunting. If we share information, we build a better community. We’ve got people on our side and a higher quality of work. That’s why I’m happy to feature Open Cover Letters today. This is a site which allows job hunters to share with each other the secrets of their success. It provides good examples, which for me personally have created clarity and improved the quality of my work. Please enjoy this interview! 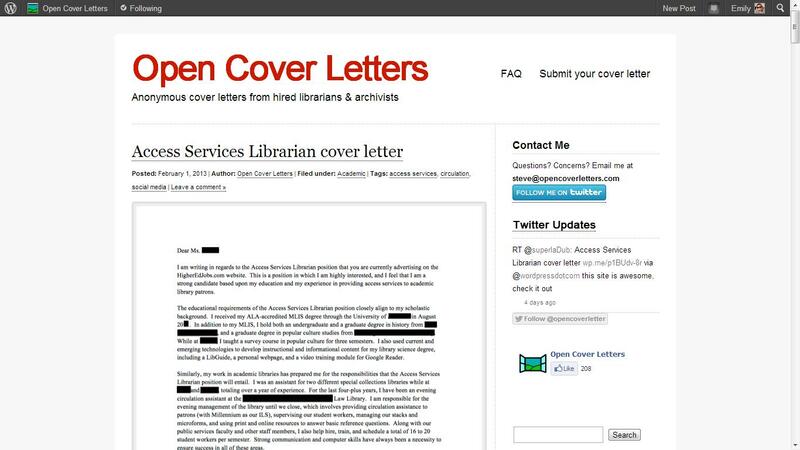 Open Cover Letters aims to help inspire library job hunters write great cover letters. Over 60 hired librarians have graciously submitted cover letters they wrote as part of a successful library job application. I created the website in June 2011 after completing a job search. I found that existing cover letter websites were generic and unhelpful. I wished I could have read real examples of librarian cover letters. After accepting my current position, I approached friends and colleagues who were hired, and launched the website with five anonymized cover letters. Stephen X. Flynn, Emerging Technologies Librarian at the College of Wooster. Wooster, Ohio. I am not a career expert at all! Instead, I try to offer advice based on my real world experience both applying for jobs, and also now hiring. I have partnered with ALA JobLIST to present cover letter workshops at the Job Placement Center at ALA. I tell the story of my own job hunt, share what I’ve learned from hiring, and use a worksheet and activities to engage the attendees in reflective practice. If you are looking for a library job, whether you’re an MLIS student, or an experienced library administrator, you should benefit from reading successful library cover letter examples. I think it’s best to browse the website as needed, and use the tags and categories to narrow down to a specific type of library or job description. Yes! When I started the website, I hoped that librarians who were helped would pay it forward by submitting their own cover letter. This has happened countless times as cover letter submitters have told me in the email that they found my website to be helpful. Some readers have also asked me for cover letter and resume advice directly, and one individual in particular told me that after making significant changes to the resume and cover letter, the rate of call-backs went up. There is no magic formula to the perfect cover letter. Like other forms of composition, it’s a form of art that requires time and passion to succeed. Also, an outstanding resumé is just as important as an outstanding cover letter. The two should, in perfect synchronization, communicate your strengths and address the job requirements. You’ve heard the advice that you should tailor your cover letter, but you should also tailor your resumé. A healthy support network is critical to getting through the job hunting highs and lows. Ask your friends, family and colleagues to critique your job applications. Reach out to hired librarians for advice and support. I know how tough the daily struggle is, and I believe that with the right combination of passion, initiative and support, you’ll be able to find an amazing job! Tired of getting kicked around by libraries? Are you intrigued by the myriad of possibilities for using your degree? Want an alternative LIS career? Today we are featuring the site for you! Kim Dority was kind enough to talk to us about her blog, Infonista. Infonista is a blog that focuses on all the different ways LIS professionals can deploy their information skills, in both traditional and nontraditional environments. In addition, I try to bring in information from outside the profession that may be relevant to building a resilient LIS career. It was started in June 2010 as a way to extend the reach of a course I’d been teaching in the University of Denver MLIS program – I wanted more students (and LIS practitioners) to understand how incredibly valuable their skill sets could be if they took a broader approach to information work. I (Kim Dority) run it, but I have to admit (with embarrassment) that I’ve been somewhat neglectful of my blog recently due to other commitments, e.g., creating and managing the LinkedIn LIS Career Options group and finishing off a recently published book, LIS Career Sourcebook: Managing and Maximizing Every Step of Your Career (Libraries Unlimited, 2013). My goal for this year is to be a much more diligent blogger! I don’t necessarily consider myself a “career expert,” but more of someone who’s done nearly every type of LIS work in her career and who has researched and taught courses, webinars, and workshops on this topic for 13 years. During that time I’ve had the extreme good fortune to learn from hundreds of colleagues, students, friends, and even mentors, so I consider myself more of a conduit for and aggregator of all the stuff we’re learning from each other. LIS students and professionals, especially those trying to explore or navigate into broader career opportunities that will use their information skills. I’d say noodle around. All of the posts are tagged by a specific category, so if users are interested in a specific topic, they should be able find all the posts on that topic. My goal is to post weekly, although as I mentioned, that’s currently aspirational rather than reality! I’ve actually never tracked this information so have no idea! Hmmm…. I think I’d encourage your readers to think as broadly and creatively about the application of their LIS skills as possible in order to find jobs, and then continue to keep an eye out for “alternative uses” even after landing those jobs. Given this economy, I believe it’s really important to operate as if we’re all self-employed, regardless of where we happen to be working at any given point in our careers. My goal is to help LIS students and professional create resilient careers, which often means rethinking what we do, how we do it, and who we do it for. One thing this blog has made me aware of is all the different ways that state library associations help out job hunters. You know how it’s super tough to get that very first library job? And how sometimes new professionals feel a little hung out to dry once they’ve graduated? Well, this week’s post is about a Maryland resource which helps address that problem, and provides a lot of great support for developing a library career. This week we’re featuring MLA Deal! DEAL (Development of Emerging and Aspiring Librarians) is an interest group of the Maryland Library Association (MLA) dedicated to providing new professionals and library students with resources to create the library career they want. MLA has had a student interest group for some time now, but around Spring of 2011 Mark de Jong, our Chair, started talking seriously about revamping it. Through his direction and the vision and efforts of our team, we’ve relaunched the group, expanded its audience, and reignited interest in MLA! Our main goal was to help those new to librarianship (early-career librarians, students, and library techs) navigate the waters of employment, providing opportunities to network and explore the profession and giving them tools to get the jobs they wanted. Mark de Jong, an active member of MLA, is our Chair. But in reality we have a much more decentralized approach. There’s a somewhat large group of us (around 12), but we’ve each got dedicated roles. I’m the social media manager, so I oversee our Twitter & LinkedIn accounts, as well as some of the blog. I’m hesitant to call myself a career expert, but being in school and concerned about finding a job that used my degree has provided plenty of motivation for me to research different career options! The thing about the DEAL leadership team that I love so much is that we represent such different paths for information professionals. For instance, Lindsay Sarin (our mentorship expert and conference liaison) is a coordinator for University of Maryland’s MLS program, so her job is to help library school students think strategically about their time in school and how it relates to their career goals. Katy Berube, who contributes to our blog, is an academic librarian with an immense wealth of HR knowledge that we’re lucky to draw from. We’ve all got different strengths and areas of expertise, and together it helps to enrich the kind of career development programming that DEAL offers. While our aim is to help library school students and new-to-the-field professionals, we also reach out to those who are more established in their careers for advice and mentorship opportunities. Everyone should use all of our web presences daily- just kidding! We actually have a multi-platform approach for our group with the intention that people could participate as much or as little as they wanted. Our blog is our main programming focus, featuring bi-monthly career development posts by the aforementioned Katy. These posts are designed to be followed almost as steps for building networks, finding relevant job postings, writing resumes, cover letters, etc. We also post news related items and job/internship/volunteer opportunities on the blog. Our LinkedIn group builds on Katy’s programming, serving as a space for people to connect and share how they’ve worked through her blog challenges. The group is also a place for general networking and discussion. Lastly, our Twitter is meant to be an everyday news item source. I do some relevant job/internship/volunteer opportunity posts, but also share general career advice, publicize good professional resources (like Hiring Librarians!) and interesting tidbits from Libraryland. √ Newsletter: well, you can sign up for our listserv on the MLA site! Nope! Access to all of our resources are free. We do encourage people to join MLA, however. We’ve been able to secure a lot of funding through our scholarship program, which allows current MLA members to contribute the cost of a year-long student membership to MLA. We’ve received a ton of support on this initiative, including a rather generous donation from an HR and organizational development consulting company (thanks Singer Group!). As a group, we’re extremely proud to be able to offer this to our members. We’re still relatively new, and we just reached how to write resumes in our programming, so we haven’t had the chance to start making career connections. We have, however, been successful in finding students mentors, internships, field study sites, and even freelance work! My personal piece of advice for job hunting isn’t necessarily unique, but has always proven wise in my experiences- be open, be professional, and be social! The last one can be hard for librarians, but every interesting work-related opportunity I’ve gotten has been a result of meeting people and staying in contact. You might meet someone in a hiring position for your dream organization, but at that moment they don’t have an open position perfect for you. Staying in contact and making a consistently good impression does wonders, though, and they’ll remember you when something comes up. Oh, also join your state library association! They’re an easy way to involved and you’ll definitely meet people who can connect you to job opportunities. If you’re a MD resident, contact us for details on how to get a free MLA membership!